I use the term ‘retail’ loosely to develop a futuristic merchandise strategy for your libraries. At present you have what I understand as ‘hub’ libraries. 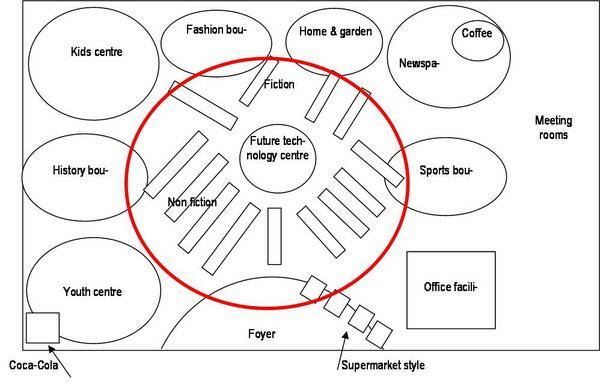 I believe from a merchandise perspective you should categorise libraries based on available public space. ‘Village Libraries’ may be a term used in the future. Their objective is to provide a service to the local community. A village library (I dislike the word Municipal) would be a small, simply laid out book lending facility. Well signed categories laid out as the consumer thinks – e.g. Home and Garden, Cookery, Crime etc. Category B Libraries – above 1,000 square metres floor space ‘Community Libraries’ such as the proposed Caloundra City Library development. This should be your futuristic library and it should be themed. Its objective should be your major community centre with maximum book lending. To develop this concept it is my view that you will need to design a concept library. Coffee shops are now an integral part of many retail concepts and as you will be aware, are highly successful in the book industry with Chapter 21 and Borders Books leading the way. It is inevitable that a major coffee chain such as Dome or Starbucks will look at 1,000 square metre libraries as a franchise market opportunity. A Coca Cola machine in the Youth Area would serve the same role as the coffee shop, but obviously aimed at a different target market. Specific categories should be identified as new ’boutique’ lending opportunities. For example, the history category could be separated out and the local history society could help with creating the theatre for this department. This would encourage partnerships between societies and the library, which will create a win:win opportunity for the library, society and local residents. i.e. Opportunity for society to get new members, Library meeting room used by society, Society expertise in assisting to grow the collection, Display material provided by society, Theatre to interest consumers. I have used history as an example, but a number of categories could be developed in this way. It is envisaged theatrical departments would be located around the edge of the library and in the grid in the centre of the library. Checkouts. The existing checkout style provides thieves with wonderful opportunities to steal books. John Stanley is a conference speaker and retail consultant with over 20 years experience in 15 countries. He regularly contributes to retail magazines around the world and has authored several successful marketing and retail books including the best seller Just About Everything a Retail Manager Needs to Know John Stanley Associates produce an e-newsletter specific to retailing, this includes innovative ideas and advice to help you grow your profits. If you would like to receive a regular copy just click here.